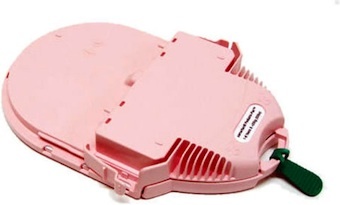 The HeartSine Samaritan Pediatric® Pad-Pak™ Integrated battery & electrode system is an "all-in-one" cartridge which contains a pair of single-use electrode pads and the system battery. This Pediatric Pad-Pak is for patients less than 8 years old and/or 55 pounds (25 kg) or less. Pad-Paks will expire 4 years from the date of manufacture. HeartSine Pad-Paks must be replaced after use, or once every 4 years regardless of use. You'll find an expiration date marked on the cartridge.